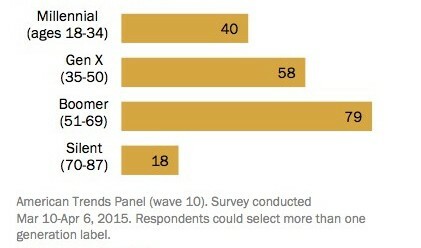 Baby Boomers, on the other hand, are quite okay with their label. Millennials just have to be unconventional and rebellious about everything, don’t they? And one thing they really will not accept, apparently, is the term “Millennial” itself. A new Pew survey indicates that of the roughly 75 million Americans born between 1981 and 1997, only 40 percent say the label “Millennial” applies to them. A third of them, mostly those born in the early to mid-’80s, identified more strongly with the term “Generation X,” which is the label demographers use for Americans born between 1965 and 1980. The main reason so many people born between 1981 and 1997 aren’t comfortable with their label is probably that the boundaries of their generation are more arbitrarily defined than those in the past—nothing particularly differentiating happened in 1981. By contrast, 79 percent of Baby Boomers, who get their name from the well-documented spike in births following World War II, said that their generational label fit them snugly. To make matters more complicated, the bookend years of the Millennial generation aren’t firm. The writers William Strauss and Neil Howe, who coined the term and used it in their 1991 book Generations: The History of America’s Future, 1584 to 2069, initially drew the border at the year 1982, reasoning that children born around that time were the first reared by a new type of hyper-protective parent. Pew, though, picked 1981, because Americans born then entered their teenage years during the Clinton administration. Regardless of who coined them, generational labels persist as organizing ideas because demographers, such as those at Pew, and marketers find them convenient. (Magazine editors, admittedly, like them too.) This convenience often comes at the cost of over-generalizing. Many older Millennials who didn’t spend their childhoods with the Internet and cell phones and who graduated college before the 2008 financial downturn find it unnatural to be lumped in with today’s 18-year-olds.